Protecting roost and nest sites. Creating rough grassland – a fantastic wildlife habitat. Preventing Barn Owls from becoming road casualties. Reducing the widespread poisoning of Barn Owls by rat poison. Empowering people to take action. Site loss, often the result of poor planning decisions, is a major cause of Barn Owl decline. We’ve had some success getting planning officers to be aware of Barn Owls and ensure their needs are met but it’s a constant uphill struggle. 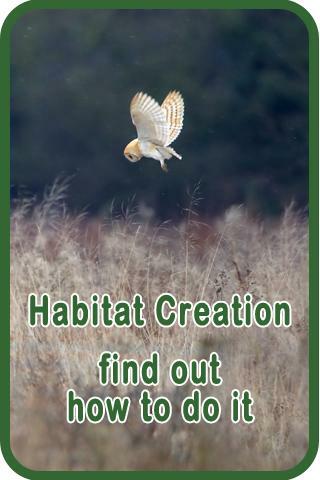 In 1995, with help from English Nature (now Natural England), we provided every planning office in Britain with our booklet Barn Owls on Site – this was the first such information ever circulated. In 2009 we produced a more detailed guide with assistance from Natural England. Our current advice is contained in Barn Owls and Rural Planning Applications – a guide 2015. Continue reading about nest and roost site loss or Barn Owls and planning. Our campaign to protect existing Barn Owl sites has received its biggest boost through the training of ecological consultants whose job it is to survey sites that are due for development and make the right recommendations. Continue reading about our training courses. Rough tussocky grassland is not only the best foraging habitat for Barn Owls in Britain, it’s also a fantastic habitat for other birds, wild flowers, butterflies and other insects plus mammals, reptiles and amphibians. Our campaign for rough grassland creation is delivered through all our talks and publications, articles in the media, as well as TV appearances and collaborations with the RSPBand DEFRA. Every year, about 25% of all the young Barn Owls that fledge end up dead on the side of a motorway or other fast open-plan road. Our report on this contentious subject remains the only one published in Britain and includes recommendations for fundamental changes in the design of major road verges. Trying to get the Highways Agency to change the way they do things is not easy, although we’ve had some success through providing advice to consultants concerning individual road schemes. Continue reading about Barn Owls and major roads. A ban on preventative/permanent baiting. Use only as a last resort. Vast improvements to product labelling. In 2016 we responded to the EU consultation on alternatives methods of rodent control that could be substituted for rodenticides . Read the Barn Owl Trust response to the EU Biocides Consultation. Read more about rats, rat poison and Barn Owls. Find out how to control rats as safely as possible. Every year, our Conservation Team receives numerous ‘fallen owlet’ calls and there are certain to be many hundreds of fallen nestling Barn Owls that go unreported. These owlets are generally ignored by the parent birds and are predated or starve. Although lack of food is sometimes a factor, in many cases nestling Barn Owls fall because the nest place is unsafe – sometimes it’s a narrow ledge or undersized cavity but more often a poorly designed nestbox is to blame. 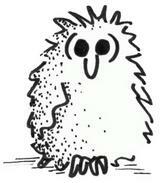 The fact that owls have nested and bred successfully at a site does not mean that the nest place is safe. We started using ‘deep nestbox designs’ in 1997 and these are now considered ‘best practice’ by most nestbox schemes across the UK. Continue reading about poor nestbox design and the solution. 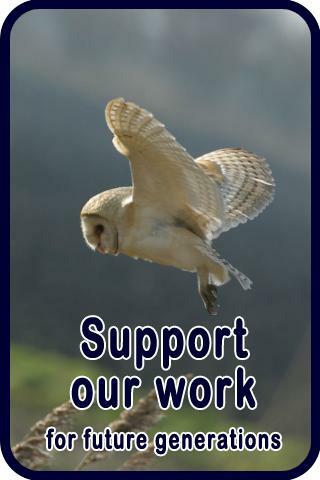 Barn Owls need your help! Town folk, country folk, young or old, amateur or professional, all of us can help to ensure that the magical sight of a Barn Owl in the wild will still be seen in years to come. Support wildlife-friendly farming by changing your shopping habits. 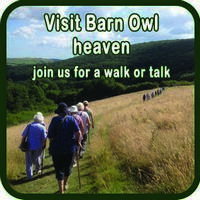 Become a Friend of the Barn Owl Trust. Create a patch of rough grass, erect a nestbox, or start your own Barn Owl project! There’s no shortage of ideas. 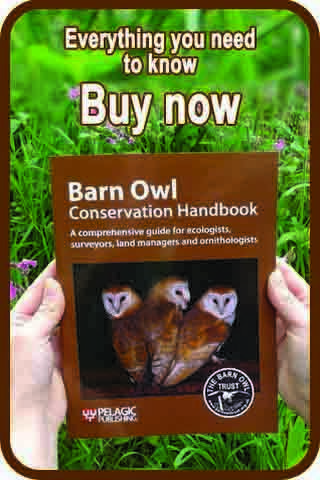 Use our site map to locate the information you need or go the whole hog and buy the Barn Owl Conservation Handbook.